Healthy Children > Safety & Prevention > All Around > Should My Child Be Retested for Lead Exposure? ​​A government alert about a faulty brand of lab test used by doctors to measure blood lead levels has some parents wondering: should my child be tested again? Most children don't need to be retested. The children who may need a new test are those who are under age 6 as of May 17, 2017 and had a venous blood test—in which blood is drawn from the arm. Parents of these children should discuss with their pediatrician whether a new test is needed. This recommendation follows a warning from the U.S. Food and Drug Administration (FDA) that a specific kind of venous blood lead test using Magellan LeadCare Testing Systems may be inaccurate. These tests have been found to underestimate the amount of lead in blood samples. When are Venous Blood Lead Tests Given to Children? A venous blood test usually is given after a child is first screened for lead poisoning with a drop of blood collected with a finger or heel stick. These stick tests, also known as capillary tests, are not affected by the FDA warning. 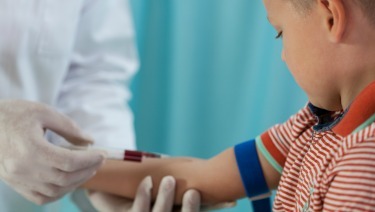 If a capillary blood test suggests a child has elevated blood lead levels, pediatricians may follow up with a venous blood test to confirm the results. Children under age 6 whose results were 10 micrograms per deciliter (µg/dL) or lower from the faulty brand of venous test may need to be re-tested. Most important, for all children, is to make sure their home environment is free of lead. Children can be exposed to lead in a variety of ways, such as living in an older home or a home undergoing renovations, or in a home with lead pipes. Certain toys, hobbies and parents' occupations also increase the risk that a child could be exposed to lead. "There is no safe level of lead exposure for children, and the best 'treatment' for lead poisoning is to prevent lead exposure before it happens," said Jennifer Lowry, MD, FAAP, chair of the American Academy of Pediatrics Council on Environmental Health. Children in at least 4 million U.S. households are exposed to high levels of lead, according to the Centers for Disease Control and Prevention (CDC). Even low-level lead exposure, at blood lead concentrations below 5 µg/dL, can raise risk of intellectual and academic disabilities in children. Lead exposure also is linked to higher rates of conditions such as hyperactivity and attention deficits, and lower birth weight. If you are concerned about your child's risk of lead exposure, talk with your pediatrician.